WICHITA, Kan. -- A small plane lost power after takeoff and crashed into a flight-training building while trying to return to a Kansas airport Thursday, killing at least four people, injuring at least five others and igniting a fire that sent up towering plumes of black smoke that could be seen for miles around Wichita, officials and witnesses said. Only the pilot was on the plane. CBS Wichita affiliate KWCH-TV reports that about 100 people were in the building at the time of the crash at Wichita Mid-Continent Airport but most were safely evacuated. Four people remained unaccounted for hours after the crash, but were later located. The pilot, one of the four fatalities, has been identified at 53-year-old Mark Goldstein, KWCH reported. None of the other victims were identified. Two sweeps of the building found no more victims, though officials cautioned that a small portion containing a simulator room had not been checked because of structural dangers from the crash. Special equipment was being brought to the site that would allow access to the remaining space. "We understand that this is a very difficult time, especially for folks who have family members who are working out here and they don't know," Crisp said. The crash was "not an intentional act," Wichita Police Deputy Chief John Speer said. "We are comfortable in saying this is an aviation accident." One person was in serious condition at Via Christi Hospital St. Francis, another was in fair condition and three more who were treated and released, hospital spokeswoman Maria Loving told CBS News. CBS News transportation safety analyst Mark Rosenker told CBS Radio News that the building is next to an FAA flight standards district office. It appeared to strike the top of the building and ignite what Wichita Fire Chief Ronald D. Blackwell described as a "horrific" fire. In comments late Thursday, National Transportation Safety Board investigator Leah Yeager said the pilot reported a left engine problem soon after takeoff. Yeager said the plane was "flying low and slow before it entered a left turn," according to witness reports. 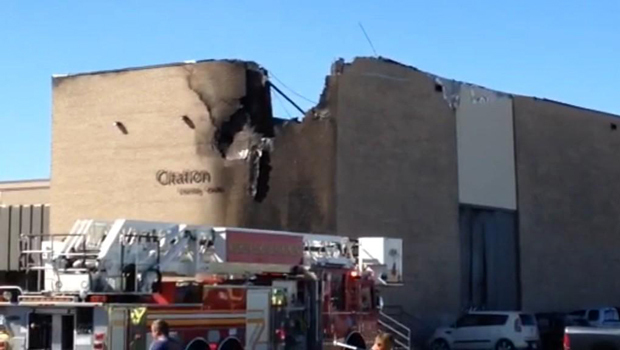 "It continued to turn left and then impacted the (FlightSafety) building," Yeager said. Jeff Papacek, 39, of Wichita, said he saw a "giant fireball" as he was heading to his engineering job at Learjet, which has a testing facility at the airport. He said he didn't see the crash because there were too many buildings in the way, but he said the plane caught his attention beforehand. "We are used to planes flying straight with the runway and this plane just didn't look like it was lined up and was way too low for the direction it was going," Papacek said, adding that he drove to the crash site to see what was happening and saw the building fire raging. FBI spokeswoman Bridget Patton said it is "too early to rule anything out" about the cause of Thursday's crash and confirmed the FBI is assisting in the investigation, but stressed the agency's protocol is to respond to "any and all plane crashes at airports."